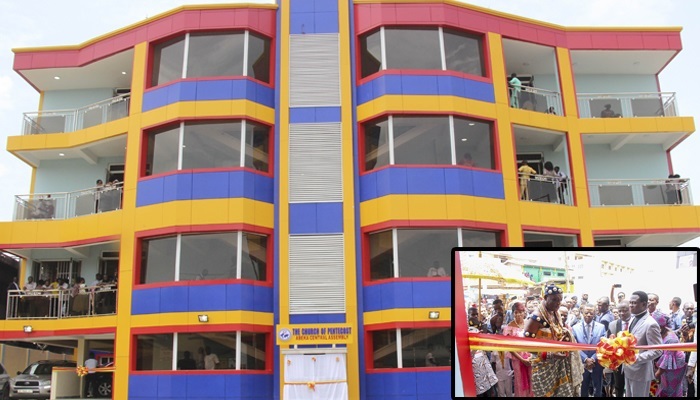 The Chairman of The Church of Pentecost, Apostle Eric Kwabena Nyamekye, on Sunday, March 31, 2019, dedicated the newly constructed ultra-modern Abeka Central Assembly church building in the Kaneshie Area. The magnificent church building which has various auditoriums for the Central assembly, English assembly, and Children’s Ministry, as well as a car park, baptistery, various offices, disabled ramp and other facilities, is valued at GH₵4,330,828.90. The remodelling of the Abeka Central Church building became necessary following the deplorable state of the old building which had developed serious structural problems. Cracks had developed in the walls and many of the concrete columns were failing, thus posing a threat to the safety of worshippers. Dedicating the edifice, Apostle Nyamekye commended the members of the district for their zeal and commitment which has brought about this great achievement. He specially commended Elder Patrick Kwame Danso, a member of the District Executive Committee, and his wife, Deaconess Gifty Danso, for their outstanding contribution to the project. Elder Patrick Danso, who is an estate developer and building contractor, single-handedly, funded over 70% of the project. Speaking on the topic, “What Shall I Render to the Lord” based on Psalm 116:1-19, Psalm 22:4 and Psalm 100, the Chairman admonished believers to show appreciation to God at all times. He bemoaned the attitude of believers for not appreciating God for the good things He does or provides for them. He noted that there are a lot of things to be grateful to God for. “If we are able to walk and throw our hands in the air, it is an indication and a clear evidence that God has been good to us and, therefore, we must render to the Lord what He deserves. You may not have received many of the things you have prayed for, but always remember that God is Holy and He is good,” he noted. Apostle Nyamekye advised members of the Church to be grateful to God for giving them a beautiful place to meet for fellowship. He tasked them to go out of the church to preach the goodness of God to the world. He concluded by calling on members of the Church to position themselves to be used by God to bring the lost to the saving knowledge of Jesus. According to him, this is one sure way of showing their appreciation to God. Sensational gospel legend Elder Dr. Kwasi Meriku blessed the occasion with classical Pentecostal songs and used the opportunity to present an award he won recently from the Africa Gospel Awards Festival (AGAFEST) to the Chairman of the Church. The occasion was graced by Apostle Emmanuel and Mrs. Elizabeth Gyesi-Addo (International Mission Director), Apostle Dr Daniel Walker (Rector of Pentecost University College & Executive Council Member), Mrs. Mary Nyamekye (wife of the Chairman), Apostle Fred Tiakor (Children’s Ministry Director), Apostle Mike and Mrs. Ernestina Etrue (Kaneshie Area Head), Apostle Emmanuel Achim Gyimah (Rtd) –the immediate passed Kaneshie Area Head, and Pastor Samuel R. M. and Mrs. Rhoda S. Essel (Abeka District Minister). Other dignitaries present were Honourable Deaconess Elizabeth Sackey (Deputy Greater Accra Regional Minister), Hon. Patrick Yaw Boamah (MP for Okaikwei Central Constituency), and Abeka Mantse (Chief of Abeka).